Their empires have fallen, but their mythology lives on…Zanya Coreandero is a seventeen-year-old orphan with only a single friend and no hope for a normal life. Diagnosed with anxiety and night terrors, no one believes her cuts and bruises are a result of an evil entity, and not a brutal case of self-harm.With the only home she’s ever known being the isolated institution—where breakfast is a handful of medications, the psychiatry sessions are mandatory, and her every move is watched—the only relief is her red-haired roommate named Tara, who’s more like a little sister than her best friend.Free will is strong, but destiny is stronger…When Zanya is kidnapped, she meets a group of gifted Mayan descendants, each with a unique ability. 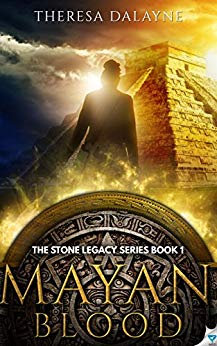 Gone from a nameless castaway to the only hope of mankind, Zanya is forced to make a grueling decision: bond with an enchanted stone and save humanity from rising underworld forces, or watch helplessly as Earth falls victim to a familiar dark deity from her dreams. This time, he’s playing for keeps.A wicked secret hides behind a handsome face…When Arwan, a dark-eyed timebender, takes interest in Zanya's mission, it's unclear if his intention is to help, or if he's on a hell-bent mission for revenge. Wary of falling for another guy with major secrets and a tainted past, Zanya fights to keep her distance. If only her heart gave her a choice.